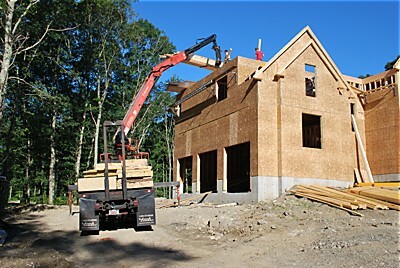 Heritage Construction is building a custom home in Rehoboth, MA using pre-cut rafters from Reliable Truss and Components. Rob Longobardi is the framer in charge. 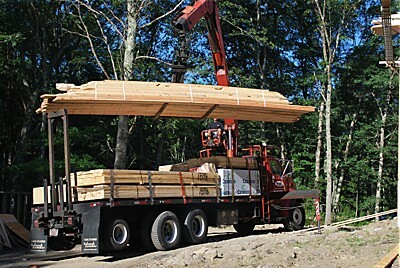 Jesse M. of Reliable Truss drives the tractor-trailer containing the pre-cut rafters to the jobsite. 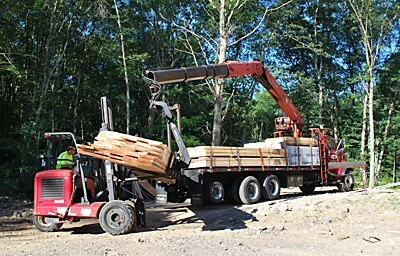 National Lumber boom truck driver Brian L. out of the New Bedford yard will use the boom to move the materials to the roof area. Jesse uses the truck-mounted Moffett to unload the materials and precisely place them where needed. In this case, he’s positioning the pre-cut rafters to be taken directly from the Moffett by the boom. The maneuverability of the Moffett allows him to drive forward or sideways as needed. Brian expertly maneuvers the boom to take the materials from the Moffett and raise them to the framing crew that is waiting to receive them. He makes it look easy, but correctly balancing the weight of the load and accounting for the width of the load as he turns it all takes expertise earned through experience. 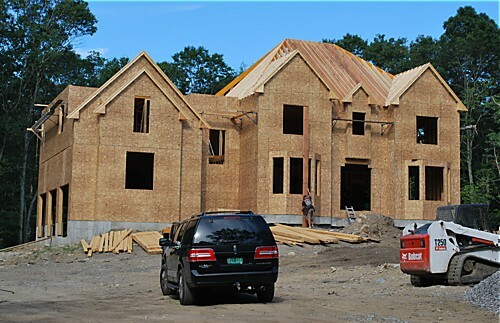 Installing the pre-cut rafters on this particular house will take about a week.